Take a look at a class roster at the University of Vermont. You'll see the usual stuff there — last name, student ID and class year. But you'll also see something else. 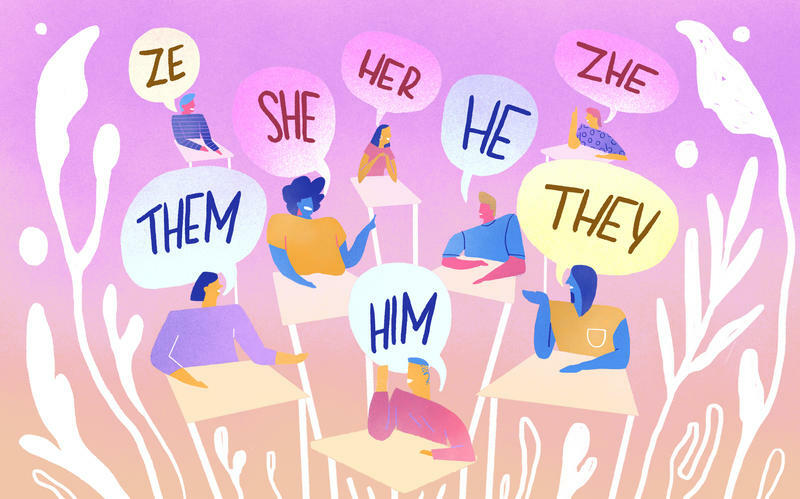 Next to some names, there are pronouns: "he" or "she," but also the gender nonspecific "they" or "ze." When Ben Shungu weighed his options for playing college basketball three years ago coming out of Rice Memorial High School, his choices were limited. The University of Vermont has selected Dr. Suresh Garimella as its next president. The board of trustees Friday morning authorized its chair to negotiate a contract with Garimella. The mother of a University of Vermont student who died of hypothermia earlier this month wants to make sure other parents don't have to go through the same grieving experience. Dorothy Connor has created the "Connor Gage Never Walk Alone Fund" in her son's memory. Students at the University of Vermont want to create an on-campus food pantry. The request follows a recent UVM survey showing that one in five undergraduate students at the university are not getting an adequate level of nutrition. Preliminary autopsy reports indicate University of Vermont first-year student Connor Gage died from exposure in sub-zero temperatures and acute intoxication. The University of Vermont could soon have a new president. The school announced that the "sole finalist" for the position, Dr. Suresh Garimella, will visit campus next week. A 19-year-old University of Vermont student was found dead Saturday morning in Burlington. How do you create a diverse student body in a state like Vermont? For some schools, it's by recruiting students from out-of-state. We're looking at ways Vermont colleges and universities recruit for diversity and how they support students who make the move to Vermont. As the 13th president of the University of Vermont, Guy Bailey expanded the campus, constructed new buildings and led the school through the Great Depression. For decades his name adorned the university library, the Guy W. Bailey/David W. Howe Memorial Library, often called simply the Bailey/Howe Library. The days are getting shorter, the hours of daylight are fewer and this time of year it's not uncommon to experience a bout of the winter blues. But a more serious form of depression afflicts nearly six percent of the population: Seasonal Affective Disorder, or SAD. We're talking about the symptoms, misconceptions and treatments for this uniquely seasonal form of depression. A renovated Gutterson Field House for the University of Vermont hockey team and a new basketball venue for the Catamounts are at the heart of a multi-purpose center recently greenlighted by the UVM Board of Trustees. Jeff Schulman, UVM's athletic director, spoke with VPR about the project. A new study from the University of Vermont shows that opposition to foods containing genetically modified ingredients in Vermont actually decreased after the state implemented mandatory GMO labelling. A University of Vermont researcher says red spruce forests in the Northeast that were once damaged by acid rain are recovering, thanks to stronger pollution controls. Did The UVM Student Protests Demanding Racial Justice Reform Succeed? Earlier this year, University of Vermont student organization NoNames for Justice pushed the school to address issues of racial justice reform. With the semester drawing to a close and graduation just days away, I spoke with two of the group's leaders about what — if anything — they feel has been accomplished. The head coach of the University of Vermont women's basketball team has resigned. Vermont’s phosphorus pollution problem is almost a century in the making and persists today, as the nutrient contained in fertilizer and animal feed continues to accumulate in watersheds.